Download "Information Privacy and Security Program. Title: EC.PS.01.02"
1 Page: 1 of 9 I. 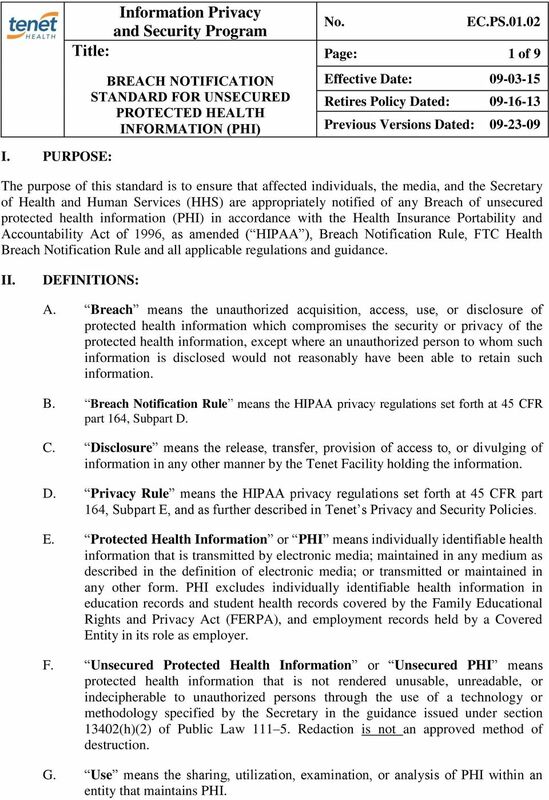 PURPOSE: The purpose of this standard is to ensure that affected individuals, the media, and the Secretary of Health and Human Services (HHS) are appropriately notified of any Breach of unsecured protected health information (PHI) in accordance with the Health Insurance Portability and Accountability Act of 1996, as amended ( HIPAA ), Breach Notification Rule, FTC Health Breach Notification Rule and all applicable regulations and guidance. II. DEFINITIONS: A. 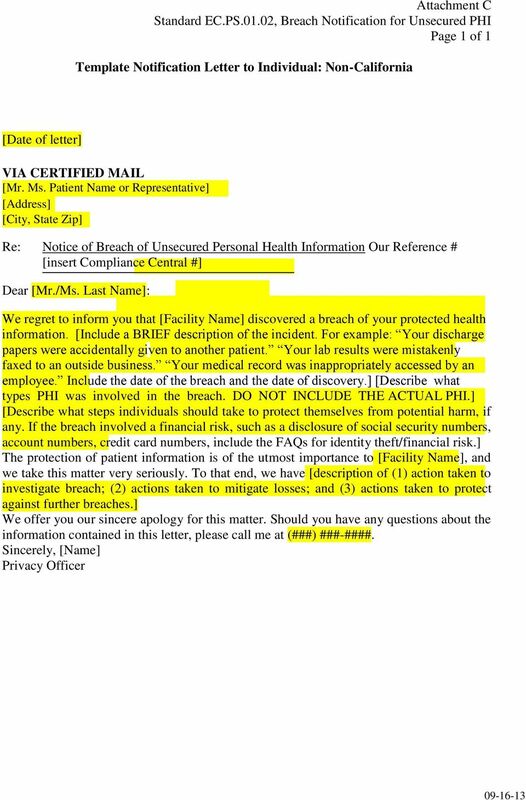 Breach means the unauthorized acquisition, access, use, or disclosure of protected health information which compromises the security or privacy of the protected health information, except where an unauthorized person to whom such information is disclosed would not reasonably have been able to retain such information. B. Breach Notification Rule means the HIPAA privacy regulations set forth at 45 CFR part 164, Subpart D. C. Disclosure means the release, transfer, provision of access to, or divulging of information in any other manner by the Tenet Facility holding the information. D. Privacy Rule means the HIPAA privacy regulations set forth at 45 CFR part 164, Subpart E, and as further described in Tenet s Privacy and Security Policies. E. Protected Health Information or PHI means individually identifiable health information that is transmitted by electronic media; maintained in any medium as described in the definition of electronic media; or transmitted or maintained in any other form. PHI excludes individually identifiable health information in education records and student health records covered by the Family Educational Rights and Privacy Act (FERPA), and employment records held by a Covered Entity in its role as employer. 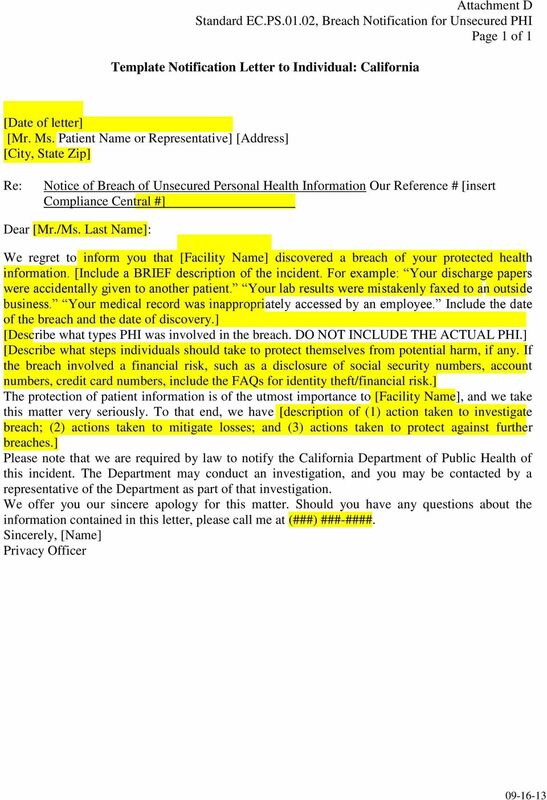 F. Unsecured Protected Health Information or Unsecured PHI means protected health information that is not rendered unusable, unreadable, or indecipherable to unauthorized persons through the use of a technology or methodology specified by the Secretary in the guidance issued under section 13402(h)(2) of Public Law Redaction is not an approved method of destruction. G. Use means the sharing, utilization, examination, or analysis of PHI within an entity that maintains PHI. 2 Page: 2 of 9 H. Additional capitalized terms used herein are defined in the and Security Glossary of Definitions. III. STANDARD: Tenet will notify affected individuals, HHS, and the media, where required, of any Breach of unsecured protected health information that compromises the security or privacy of the protected health information. All suspected Breaches of unsecured PHI will be investigated, and all necessary notifications will be sent, in accordance with the guidelines set forth in this standard. A. Breach Determination To determine whether an incident constitutes a Breach under this standard, follow the steps below. Step 1: Is the PHI Unsecured? 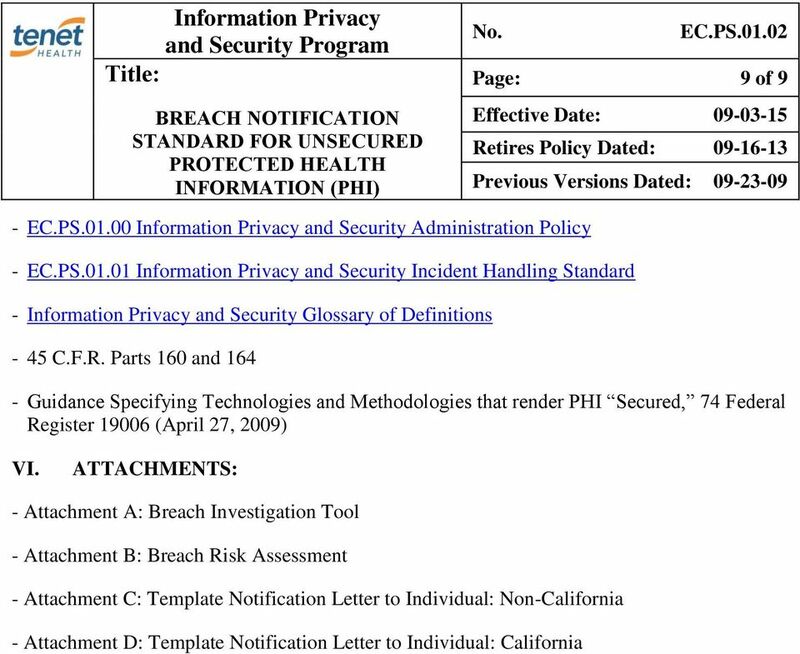 The Breach notification requirements only apply to unsecured PHI. 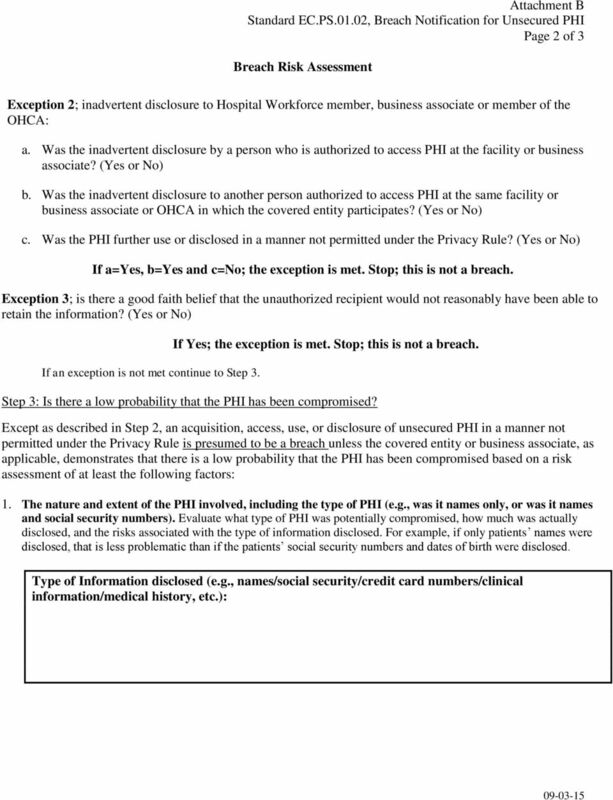 If the PHI involved in the alleged Breach does not meet the definition of Unsecured Protected Health Information described in Section II. F, the incident is not a Breach, and the notification requirements set forth in this policy do not apply. Review any state notification or other compliance requirements for applicability. Step 2: Does an exception apply? Determine whether the incident meets one of the following exceptions to the definition of Breach. 1. 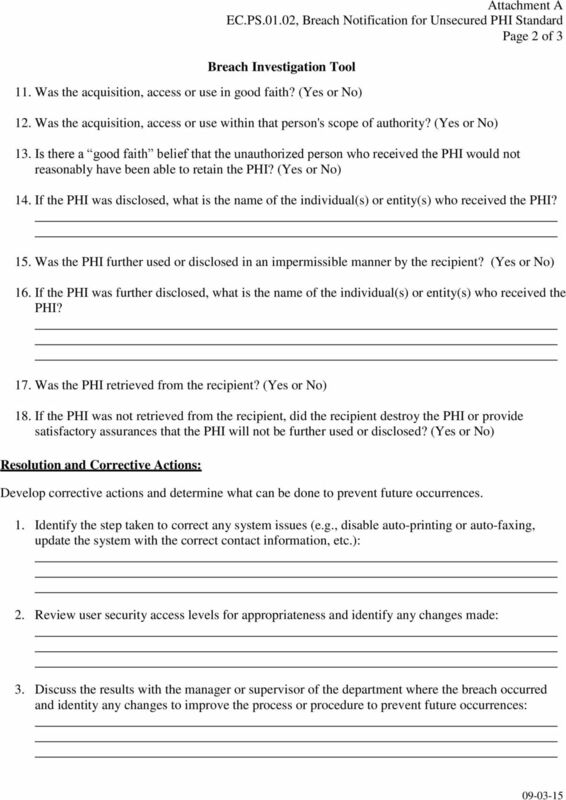 Any unintentional acquisition, access, or use of PHI by a workforce member or person acting under the authority of a covered entity or a Business Associate, if such acquisition, access, or use of PHI was made in good faith and within the scope of authority and does not result in further use or disclosure of PHI in a manner not permitted under the Privacy Rule. 2. 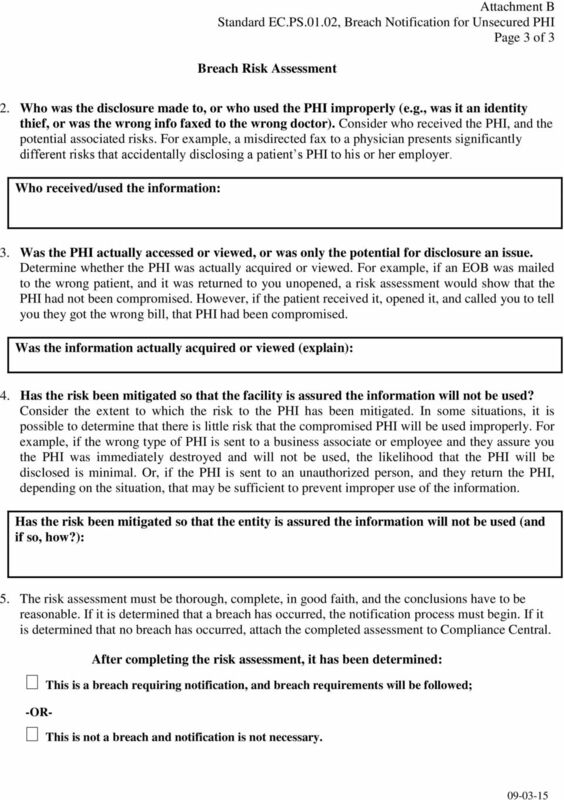 Any inadvertent disclosure of PHI by a person who is authorized to access PHI at a covered entity or Business Associate to another person authorized to access PHI at the same covered entity or Business Associate, or organized health care arrangement in which the covered entity participates, and the information received as a result of such disclosure is not further used or disclosed in a manner not permitted under the Privacy Rule. 7 Page: 7 of 9 1. 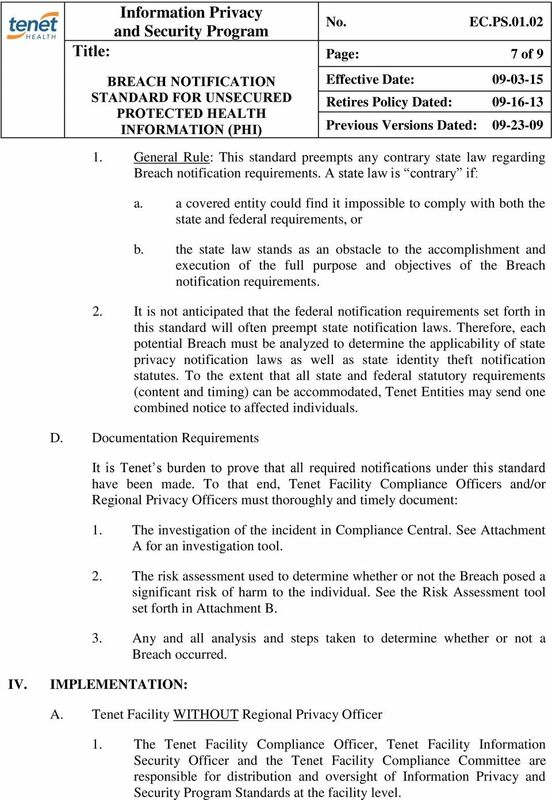 General Rule: This standard preempts any contrary state law regarding Breach notification requirements. A state law is contrary if: a. a covered entity could find it impossible to comply with both the state and federal requirements, or b. the state law stands as an obstacle to the accomplishment and execution of the full purpose and objectives of the Breach notification requirements. 2. It is not anticipated that the federal notification requirements set forth in this standard will often preempt state notification laws. Therefore, each potential Breach must be analyzed to determine the applicability of state privacy notification laws as well as state identity theft notification statutes. To the extent that all state and federal statutory requirements (content and timing) can be accommodated, Tenet Entities may send one combined notice to affected individuals. D. Documentation Requirements It is Tenet s burden to prove that all required notifications under this standard have been made. To that end, Tenet Facility Compliance Officers and/or Regional Privacy Officers must thoroughly and timely document: 1. The investigation of the incident in Compliance Central. See Attachment A for an investigation tool. 2. The risk assessment used to determine whether or not the Breach posed a significant risk of harm to the individual. See the Risk Assessment tool set forth in Attachment B. 3. 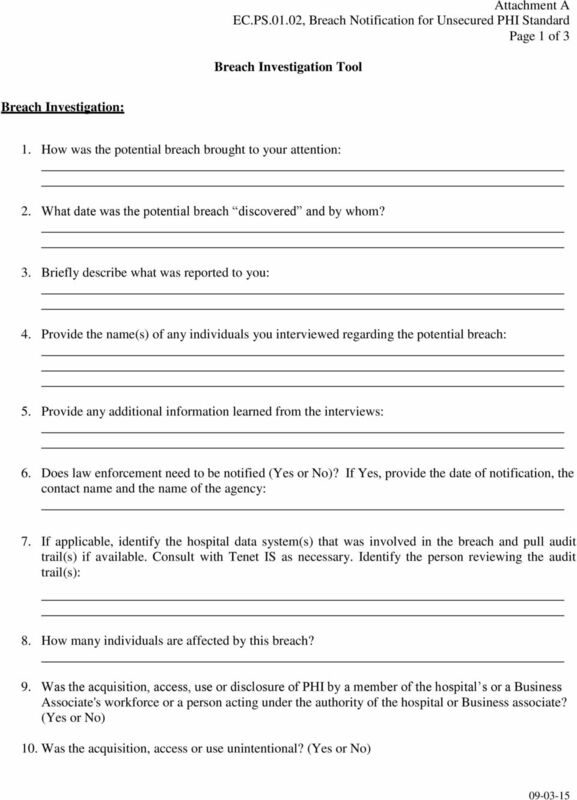 Any and all analysis and steps taken to determine whether or not a Breach occurred. IV. IMPLEMENTATION: A. Tenet Facility WITHOUT Regional Privacy Officer 1. The Tenet Facility Compliance Officer, Tenet Facility Information Security Officer and the Tenet Facility Compliance Committee are responsible for distribution and oversight of and Security Program Standards at the facility level. 8 Page: 8 of 9 2. 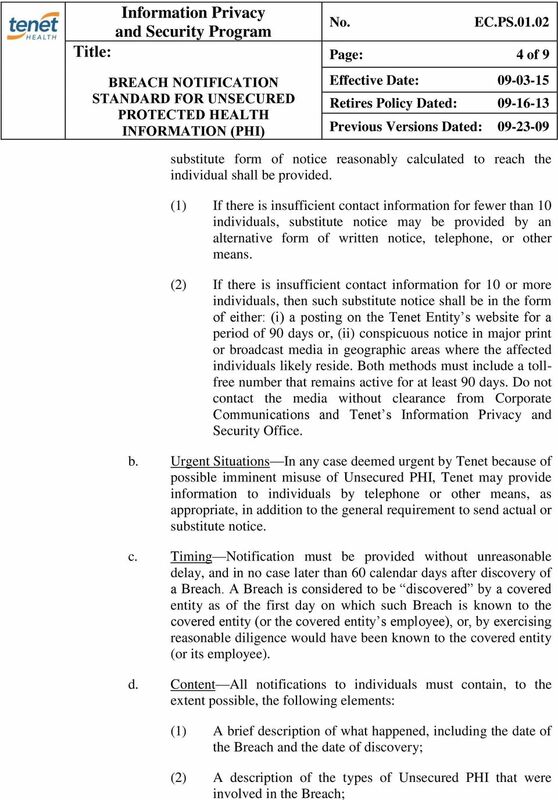 Tenet Facility will a. Adopt this standard and where necessary develop specific written procedures in order for the Tenet Facility to operationalize this standard; b. Develop appropriate methods to monitor adherence to the written procedures; and c. Report monitoring activity to the Tenet Facility Compliance Officer. B. Tenet Facility WITH Regional Privacy Officer 1. 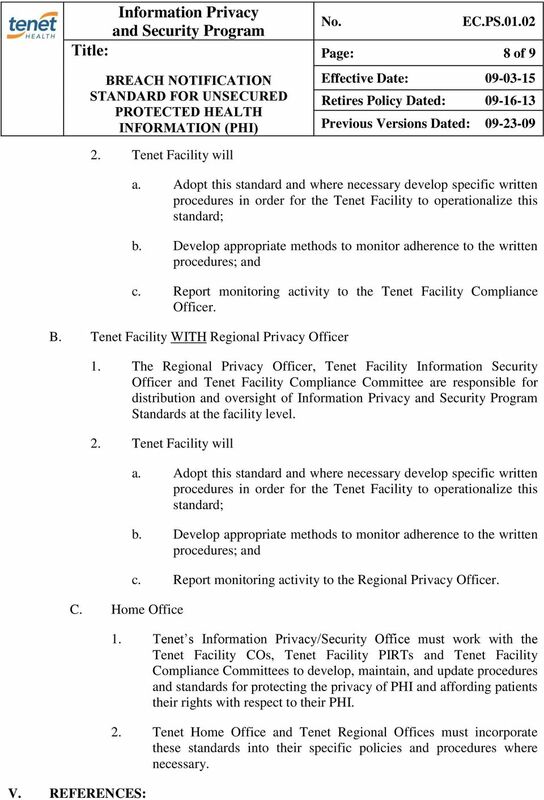 The Regional Privacy Officer, Tenet Facility Information Security Officer and Tenet Facility Compliance Committee are responsible for distribution and oversight of Standards at the facility level. 2. Tenet Facility will C. Home Office V. REFERENCES: a. Adopt this standard and where necessary develop specific written procedures in order for the Tenet Facility to operationalize this standard; b. Develop appropriate methods to monitor adherence to the written procedures; and c. Report monitoring activity to the Regional Privacy Officer. 1. 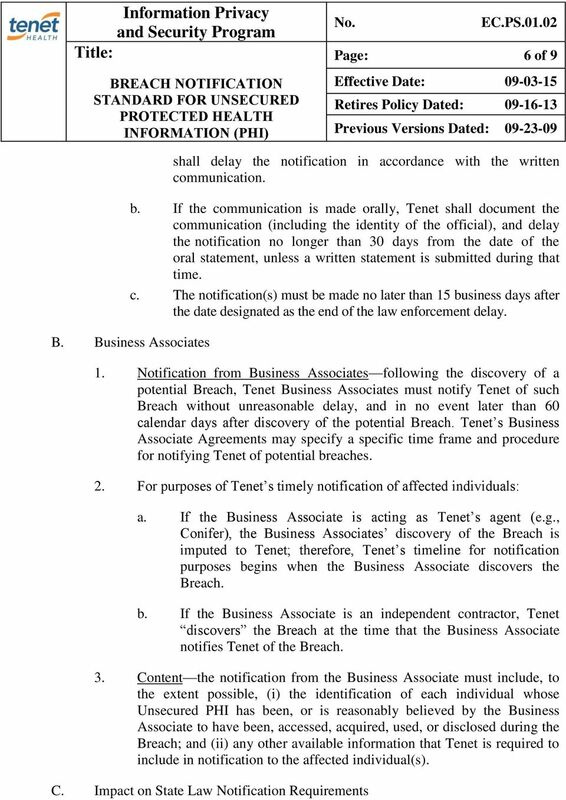 Tenet s /Security Office must work with the Tenet Facility COs, Tenet Facility PIRTs and Tenet Facility Compliance Committees to develop, maintain, and update procedures and standards for protecting the privacy of PHI and affording patients their rights with respect to their PHI. 2. Tenet Home Office and Tenet Regional Offices must incorporate these standards into their specific policies and procedures where necessary. Chris Bennington, Esq., INCompliance Consulting Shannon DeBra, Esq., Bricker & Eckler LLP Victoria Norton, R.N., J.D., M.B.A.
organization's patient protected health information (PHI) occurs. as any other federal or state notification law. Mapping to HIPAA Audit Protocols In June 2011, KPMG was awarded the contract to conduct HIPAA audits and develop an audit protocol on behalf of Health and Human Services (HHS) Office for Civil Rights (OCR).